The high-end Mexican restaurant is now facing a class-action lawsuit. When Flor Crisostomo walked into Calavera restaurant last October, where she had been employed since before its opening during the summer of 2015, she didn’t expect the news she received. 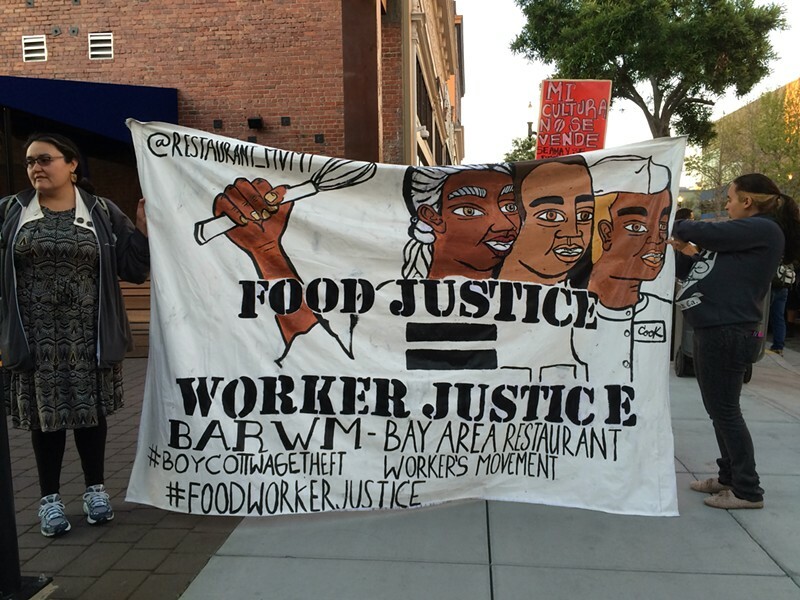 BARWM supporters carry banner declaring "Food Justice = Worker Justice"
"I went in and they fired me on the spot, arguing that I wasn’t doing enough for the kitchen, not fulfilling my responsibilities, and that production was slow," Crisostomo told the Express in an interview. "They didn’t give me a two-week notice, and they were referring to a position that was not mine." For Crisostomo and other workers at Calavera, this was not the first instance of what they perceived as an abuse of workers’ rights. Last month, Crisostomo and fellow former Calavera employees Sergio Esquivel and Maribel Hernandez filed a class-action lawsuit alleging that the high-end Mexican restaurant located in Uptown Oakland failed to pay workers the city's minimum wage, did not compensate for overtime, provided inadequate time for breaks, and did not pay owed wages upon termination. The workers are also calling on the public to boycott Calavara. The lawsuit specifically alleges that Calavera partner-owners Christopher Pastena (Lungomare, Chop Bar) and Michael Iglesias (Coqueta, Oyamel), as well as executive sous chef Adelar Rogers and opening executive chef Christian Irabien were responsible for the labor law violations. Irabien is now working at Cala in Hayes Valley, according to a San Francisco Chronicle report. “We want to make sure that labor laws aren’t broken and that workers are treated with dignity and respect,” Crisostomo said about the lawsuit. Over 110 protesters converged on Calavera for this demonstration. 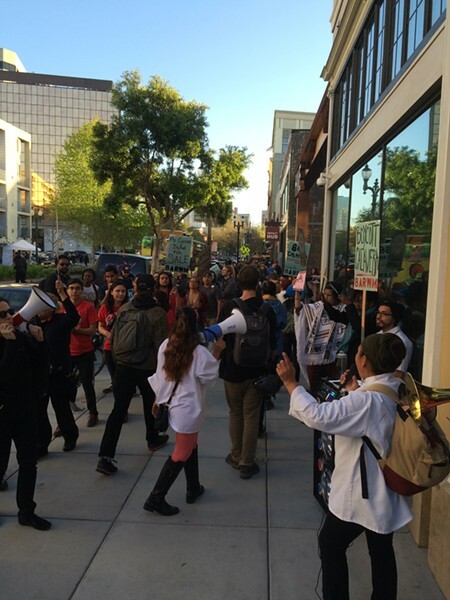 On April 1, during a busy First Friday street fair, the workers staged a protest outside of the restaurant, which is located in Oakland’s Hive development. Over one hundred food workers from the Bay Area Restaurant Worker’s Movement (BARWM), as well as members from the Brass Liberation Orchestra, housing, food justice and labor movements, showed up to help hold hand-painted picket signs and hand out #BoycottCalavera fliers. Dozens of patrons could be seen turning away from the restaurant due to the protest. “With that protest and mobility, we could reach out to other restaurant workers to call out abusive owners. It was a great way for us to say that publicly and connect with other workers to let them know that it’s okay to speak up,” Crisostomo said. Chanting "86 Calavera, Mi Cultura No Se Vende," the protesters said that the restaurant is guilty of more than wage theft. By firing workers like Crisostomo, who is indigenous to Oaxaca, Mexico, and who over five months shared her ethno-culinary knowledge with Calavera's owners, the workers are accusing the restaurant of stealing their culture. From left to right, Marisa Mendoza, Ivette Vega, Flor Crisostomo, Maribel Hernandez. "The knowledge of nixtamal — to prepare corn for tortillas — and knowing recipes that go way back to [my] roots have been taken advantage of," Crisostomo said. "That, for me, is where cultural appropriation and culture theft begins to happen." The owners of Calavera declined requests to speak to the Express regarding the lawsuit. But they released the following statement saying that the workers' claims are false: "We are a diverse group of employees and owners at Calavera with a history of fair practices and creating a healthy, supportive restaurant culture, and we take pride in being Latino, African-American and female-owned," the statement read. Paul Blasenheim, an original member with the BARWM, said in an interview that the organization will continue to support the fired workers as long as the boycott continues. "Even an allegation of these things is enough for us to protest," said Blasenheim. "We believe workers when they come to us and say to us something is happening." The lawsuit comes at a time when numerous other high-profile Bay Area restaurants, such Coqueta in San Francisco and Bottega Ristorante in Yountville, are also facing legal action from workers. 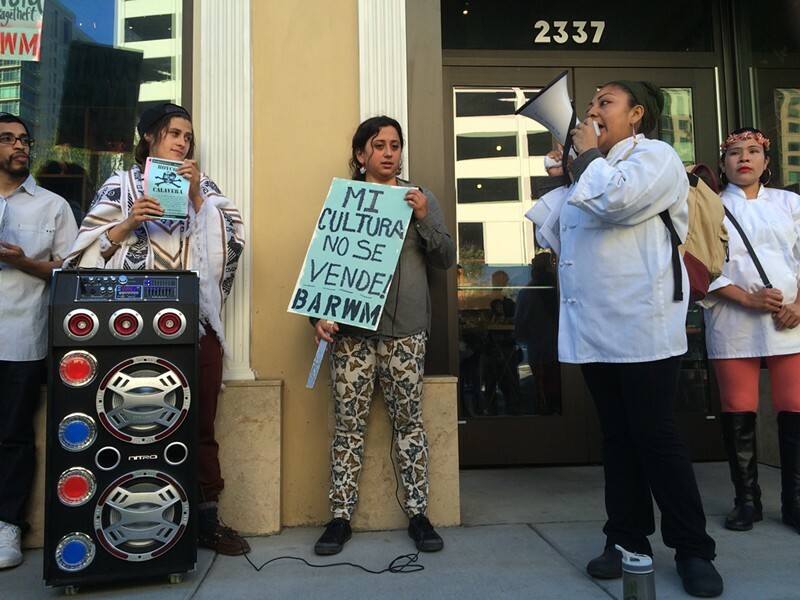 Though BARWM has not been active in those cases, Blasenheim said actions against Coqueta in particular — where two lawsuits were filed against celebrity chef Michael Chiarello and his restaurant group Gruppo Chiarello over alleged sexual harassment and labor violations — inspired the work that’s now being done in Oakland. "The ownership is similar to those who are owning Calavera, and there is a lot of crossover within the industry," said Blasenheim. "We were inspired by the leadership of powerful women restaurant workers who refuse to abide by the sexist and coercive status quo for women in general." Hector Martinez, an attorney representing the plaintiffs with the Oakland-based law firm Mallison & Martinez, said it could be up to a year until a trial happens, but that he is confident they will be successful. "We have lots of support from former workers and the records will show the violations," said Martinez. "We are very excited about our clients being so active. This is something we don’t see that often, to have so much activism on behalf of our clients with regards to our case." Moving forward, Crisostomo said she was pleased to see such strong support from the Oakland community, and that the boycott campaign will not stop until positive changes have been made. "We are not lying. We are addressing a problem that’s happening right now, and we are speaking on behalf of all the workers treated like this nationally — that includes those still working at Calavera right now," said Crisostomo.